An inviting bespoke exhibition design and build that exceeded expectations. We have been working with Sage on a wide range of projects during our relationship, but few as rewarding as the exhibition stand for the Accountex Show at Olympia in London. 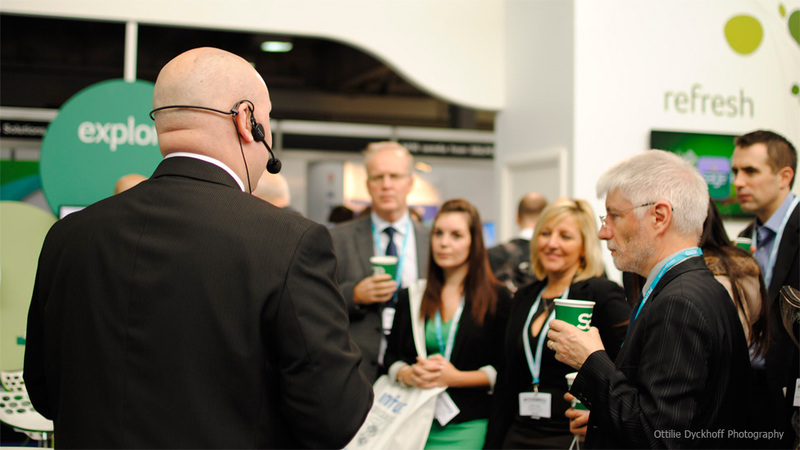 Not only was this the first Accountex show ever, it was also the first time Sage’s Accountants’ Division had exhibited too, so the challenge was set – to make a real impact and generate quality leads for Sage’s accounting software. The main objectives for the stand were to provide space for delegates to interact with both Sage staff and Sage software. Armed with a thorough brief and high expectations from Sage, we set to work generating ideas for how to include a wide range of technical and brand communication requirements within a relatively tight 36sqm plot. Opting to go down the route of a fully bespoke design and build meant we weren’t constrained by a shell scheme, and this really opened the scope for what we could do with the space. We split the stand into a series of ‘zones’ with titles inspired by the Sage brand – explore, discover, refresh, share. 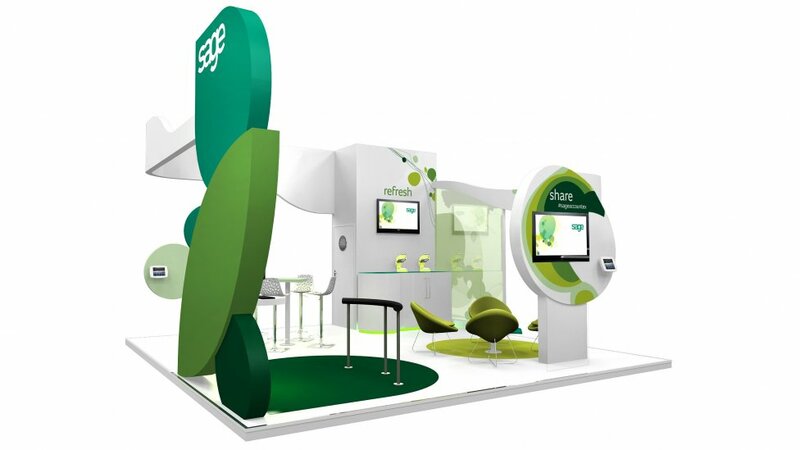 For the structure of the stand we wanted to create a dynamic, flowing feel with the highly distinctive Sage branding. Utilising the full height allowance of 4 metres we designed a sturdy and eye-catching framework full of soft edges and flowing curves. Using a comprehensive network of AV equipment, comprising of 42in and 60in plasma screens, iPads, PCs, hardwired and WiFi and a full PA system, the bespoke exhibition design was fully equipped to demonstrate Sage’s software to its max. The various interactive zones were all wired into a bank of laptops running the software and demo programmes. To create a framework which looked seamless and clean but was practical too, all the electrical and network cabling ran through the main stand structure and under the platform floor, out of sight, into a secure store room which we’d engineered into the stand. The iPads provided an area where visitors could explore the Sage software for themselves and get a real feel for the product. The iPads leant themselves well to a more relaxed, informal atmosphere, and the coffee bar with professional barista added to the friendly ambience. The coffee area included comfortable seating and was divided off from the main throng of the show using a printed semi-transparent voile. This provided not only a physical division for those seated within the stand, but also offered an intriguing glimpse into the stand for passers-by and an opportunity for Sage to display key messages. Other unique features of the bespoke exhibition design and build included custom-made tables using shapes from the Sage brand scheme, a high seating area for more formal discussions with visitors and promotional videos and messages on plasma screens (produced by ourselves). We also sourced branded neck scarves, ties and name badges for all attending staff. This, in stark contrast to the geometric shapes of the surrounding shell structures, gave the stand even more differentiation. We also used a variety of heights, textures and finishes to add to the interactivity and appeal of the stand. Sage also sponsored one of the seminar halls at Accountex, dubbed ‘The Sage Software Theatre’. We fully branded the exterior and interior of the hall to complement the stand design. Both before and after the event we created highly targeted digital marketing communications to help the team maximise their ROI and convert as many leads as possible. With an incredibly tight on-site build time of just one day, we created an inspiring, engaging and inviting ‘home’ for Sage at Olympia. Over the two-day show, the Sage team exceeded expectations with the number of leads generated and was absolutely thrilled with the design, finish and results from this bespoke stand. We wanted to look high tech, yet friendly and approachable and by suggesting comfortable seating areas, along with demonstration areas and high tech equipment we think that we managed to achieve this. Simon, Martin and Pete also helped us to create all of the invites and sourced many of the branded materials that you see on the stand. As always he was always on hand to help or offer advice which is just what you need – especially when it’s the first event of this kind that you have managed. Simon was also on hand to project manage the build and went above and beyond his role in so many ways.